No subject I discuss on this blog generates responses from readers like the topic of large black cats. The term black panther is almost universally used to describe these large cats. As has been discussed here before, the term panther is sort of a catch-all word used to describe any number of large cats but most often is used as another name for a mountain lion or cougar. Melanism has never been observed in mountain lions so science does not recognize the existence of black panthers (the “black panthers” seen in movies, zoos, and photos are either melanistic jaguars or leopards). That means little to those who say they’ve seen them, however. Simply put, they don’t care if these cats are escaped leopards, jaguars, or an unrecognized species. All they know is what they have seen. Following are just some of the emails and/or comments I’ve received over the last few months. Honestly, they have come in so quickly that I’ve had a hard time keeping up with them. I have not spoken to these folks directly and can’t speak to the veracity of these accounts. Having said that, these reports are very typical of what I hear on an almost weekly basis. While it is possible a reader or two might be pulling my leg, I truly believe that the vast majority of these people are telling the truth. They’ve seen something. The only question is what? TCH Comment: I may just take you up on that if you feel the cat is still in the area. Contact me via email at Texascryptidhunter@yahoo.com with your name and address. 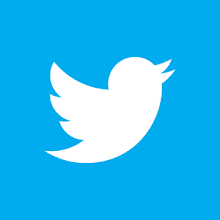 TCH Comment: This account is interesting in that a long tail was specifically noted. This absolutely would rule out a bobcat as the culprit. 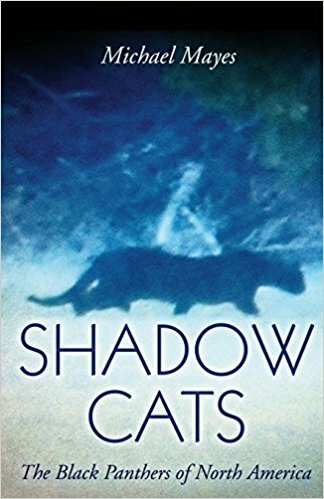 The witness notes the cat was in shadow so it is possible it wasn’t as dark as it appeared but, even so, a cat the size of a lab in this part of the state is big news. TCH Comment: This report is interesting due to the location. I’ve received numerous reports of large black cats from the D-FW Metroplex. It doesn’t seem to be the kind of place a large cat of any kind could stay hidden for very long. Another detail that caught my eye was the way the animal remained in a crouched, low to the ground, position. This is very cat-like behavior and not something I would expect from any sort of canid. The only question I would anticipate skeptics asking, since the witness never mentions any movement whatsoever, is whether it is possible he/she saw an inanimate object of some sort in low light conditions. The witness never says what time of day it was when the animal was sighted but the mention of everything "being yellow" implies, to me at least, that it was during daylight hours. The witness also states that whatever was seen was no longer there after turning around and going back for a second look. This would seem to indicate that the witness saw a living creature and not a dark stump or other inanimate object. 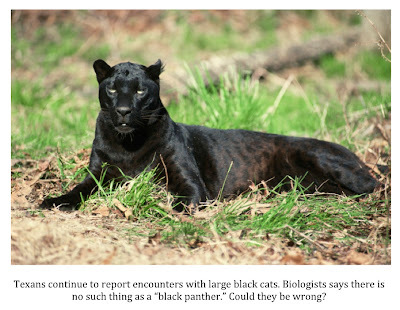 TCH Comment: The reader mentions the big cat was caught on camera. Is the photo/footage still available? If so, it would likely be enough to get the attention of TPWD officials. In addition, I’d love to see it and possibly post it here on this site. If the sightings persist in the area let me know and we can work together to try to get the photo officials need to muster their resources. Do you have reason to be concerned? Possibly, but it is likely, assuming the big cat is not still being seen in the area, the animal was just passing through. You might keep a closer eye than usual on pets and small children for a little while but it is unlikely you have too much to worry about. Just keep your eyes and ears open and apply common sense and you should be fine. TCH Comment: Hmmm, this one is interesting. The witness initially thought the animal was a fox; however, the size described, if accurate, would rule this out. The animal would be too large to be a fox. Bobcats don’t always have distinct markings and do have prominent ears but the tail described seems to eliminate this species as a suspect. The grey coloration would likely eliminate a cougar as a possibility as they are tawny-colored 99% of the time. 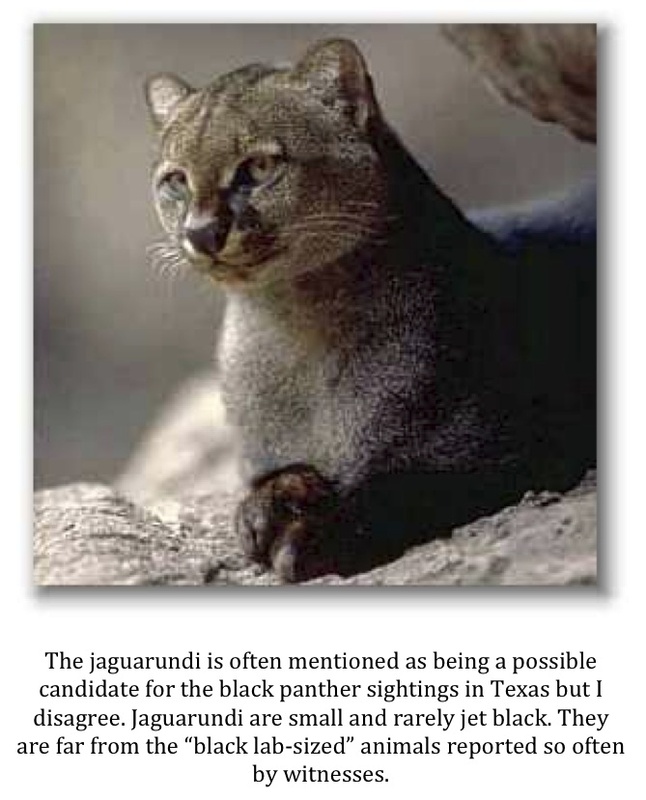 The animal sounds a lot like a jaguarundi except for the description of the large ears that were observed. Jaguarundis have small ears that are not prominent at all. Honestly, the coloration, size, and description of the ears matches the appearance of a coyote better than that of any wild cat; however, the witness mentions the tail was “like a cat, not a fox.” I assume this means it was long and thin and not bushy in appearance. If so, honestly, I don’t know what animal this witness observed. TCH Comment: Please let me know if sightings persist in the area. You are not located too far from me and it would be possible for me to get down there and do a bit of looking around. If I had access to the areas where sightings were taking place I might be able to place some cameras in the hopes of getting a photo. TCH Comment: I assume the reader is referring to Kleine, TX. If so, this is just south and west of the Sam Houston National Forest. Several big cats have been reported in the Spring/Conroe area. I know there are mountain lions in the SHNF as I saw one myself back in May of 2005. The cat I saw was a typical tawny-colored mountain lion and not black but does reinforce the notion that big cats live in or pass through the area on at least an occasional basis. TCH Comment: Greg, please let me know if you manage to get a photo. I’d love to take a look at it. The Hill Country State Natural Area is located near Tarpley. The TPWD describes this area as follows: “An undeveloped and secluded retreat that features grassy valleys, spring-fed streams, and steep limestone hills.” The Natural Area consists of 5,369 acres and sounds like very good habitat for a large cat. I’ve never visited this spot but do know there are a lot of deer and hogs running around down there. Mountain lion sightings are not unheard of in this area of the state. TCH Comment: It sounds like you live in close proximity to several areas that feature suitable habitat for a large predator. The Mineola Nature Preserve, Old Sabine Bottom Wildlife Management Area, Little Sandy National Wildlife Refuge, and Tyler State Park are all close by and feature abundant areas where a predator, like a big cat, could hunt and live. Having said that, I don’t feel comfortable attributing the loss of your neighbor’s animals to a big cat based solely on what has been shared above. Coyotes are much more common and could easily be responsible for the lost birds and small dogs. The sighting your neighbor had of a black cat with young is certainly enough to make one wonder but, unless there have been other sightings of big cats in the more recent past, the culprit here is probably something more common. The big paw prints you mentioned could provide some insight. Were photos taken? If so, would you mind sending them to me for inspection? I might be able to tell you if the maker of the prints was a big cat or a canid of some kind. TCH Comment: Wayne, I grew up in southeast Texas not too far from this location. The tales that came out of that area fascinated me. Stories of the “Wild Man” or “Ol’ Mossyback” (bigfoot-like creatures), the ghost lights of Bragg Road in Saratoga, and the screaming black panthers that haunted the bottoms of Village Creek and the bayous, swamps, and marshes of the Big Thicket National Preserve are burned into my mind. The folks that live in the bottoms and other remote and heavily wooded areas don’t think much about the existence of black “long-tailed” cats. They don’t know that they are not supposed to exist. These people just accept them as a natural part of the local fauna. I will be publishing more reports sent to me by readers who have had encounters with the mysterious black panthers of Texas soon. In the meantime, if anyone would like to report a sighting or, for that matter, discuss anything at all please make sure and send me an email. I appreciate comments left on posts but cannot reply to the person leaving the comment directly. An email will allow me to reply and have a private conversation. This is also the best way to forward me any photos. I will look forward to hearing from more of you who have seen these elusive cats. 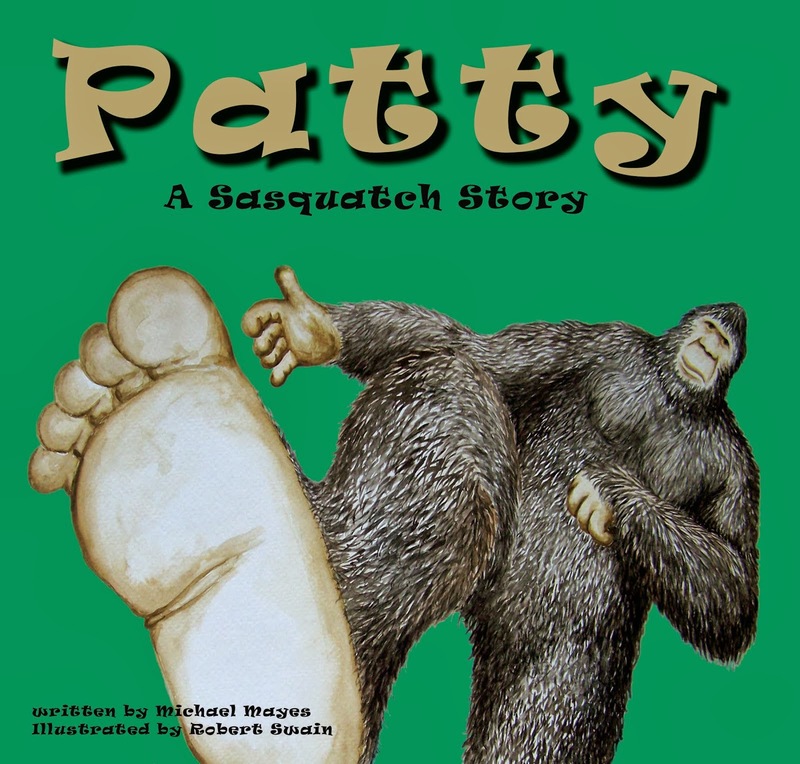 If you are interested at all in the sasquatch phenomenon The Bigfoot Show is a must listen. "Down in the valley of the jolly gray wood ape" is now available, also known as Episode 39 of The Bigfoot Show. Brian Brown interviews several TBRC members regarding their thoughts and experiences concerning the three-month "Operation Persistence" conducted in the Ouachita Mountains. Vickie and Pat Martin likely had no idea that the unfamiliar bird perched on the roof of their dock on Lake Norrell on August 9th was something special. Likely, they thought only that it was an interesting looking bird that would make a nice photo. Little did they know that they were photographing a Brown Booby (Sula leucogaster); a species never before seen in Arkansas. Lake Norrell is located about 20-30 miles west of the state capital of Little Rock. The Martins live on a peninsula that juts into the water on the north side of the lake. The bird has taken to roosting on the roof of a dock on their property. While official recognition of the sighting is pending, there is little doubt that the bird in question is a Brown Booby. Multiple people, mostly avid birders, have seen and photographed the bird, which doesn’t seem too shy about having visitors. 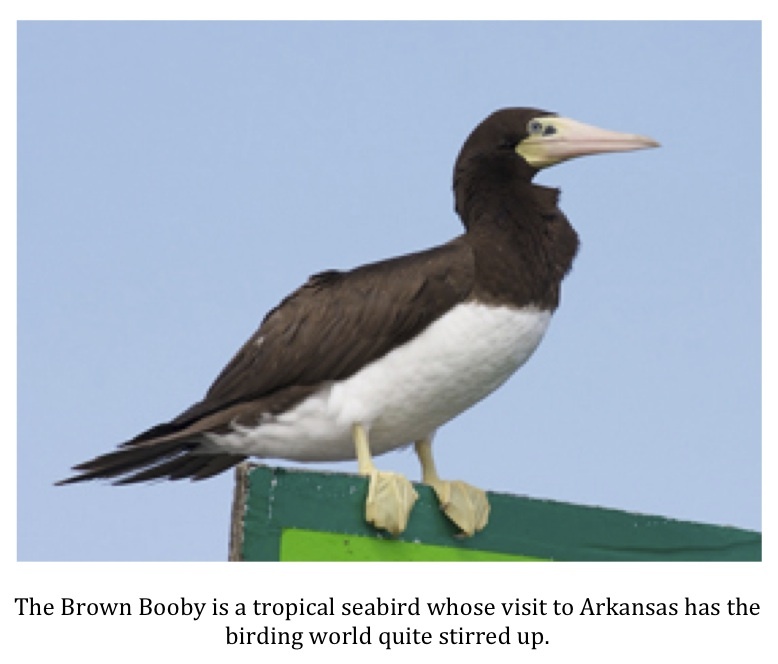 What is the big deal about a Brown Booby showing up in Arkansas? To start with, this is a seabird that is usually found in the tropical areas of Mexico and Central America. 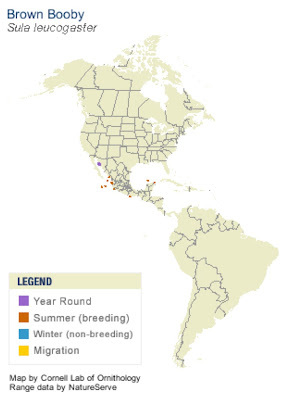 The species can be found on both the Atlantic and Pacific coasts of this region. 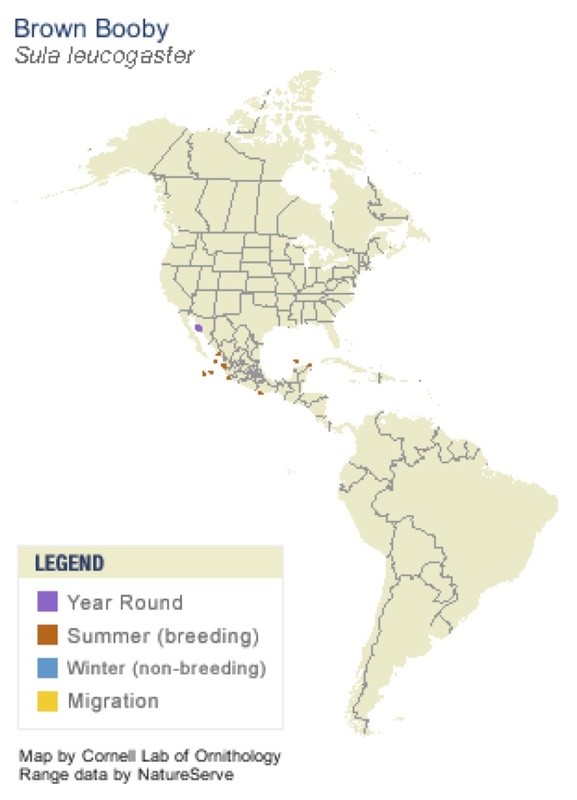 Boobies do visit the Gulf of Mexico and Caribbean during the breeding season when large colonies are formed but have always stayed far south of the U.S. The Brown Booby eats fish and small squid and can often be seen plunging into the water at high speeds in order to dive down far enough to snag one of these morsels. They sometimes fly low to the surface of the water and “skim” for jumping baitfish. I would guess this Booby is eating mainly shad at this Arkansas impoundment. So, what is this bird doing in Arkansas? Nobody seems able to answer that question definitively. Theories pretty much cover the gamut. The bird was blown north on a powerful jet stream/storm, the internal compass of this individual Booby is “broken,” and, of course, global warming has caused this tropical bird to expand its territory are all theories that have been voiced. Whatever the reason, a trip to Arkansas is something this bird is more than capable of undertaking. The Brown Booby is a powerful flier and, like other seabirds, has great stamina. Pat and Vickie Martin have been very gracious and open with birders wishing to catch a glimpse of this rare visitor. Several groups have traveled to the site and plans for more are, I’m sure, pending. There are directions to the Martin’s property on several birding sites and forums (I’m not going to post that information here) for those interested in seeing the Brown Booby for themselves. If you are in the area and have the opportunity to go out see this Brown Booby I would recommend you do so. You just never know when, and if, this opportunity will present itself again. Monster snakes in the Everglades are just a myth, right? Not so much. Yahoo News is reporting details regarding the largest Burmese python ever found in the Florida Everglades. The monster serpent measured 17’ 7” in length and weighed in at a whopping 164.5 lbs. The snake was found in Everglades National Park last May and has been studied intently by officials at the University of Florida ever since. Adding to the bad news is that this enormous female was carrying 87 eggs. Florida officials point to this fact as concrete evidence proving how comfortable this invasive species has become in the swamps of Florida. The Burmese python, as well as other exotic species, was first introduced to Florida via the exotic pet trade roughly 30 years ago. Officials believe that snake gained a foothold in the state when owners released specimens into the wild after they grew too large or too aggressive to keep in a domestic environment. These pet owners likely felt they were being humane when they chose to release these pythons into the wild rather than killing them. Little did they know the havoc this invasive species would soon wreak on the native wildlife of Florida. 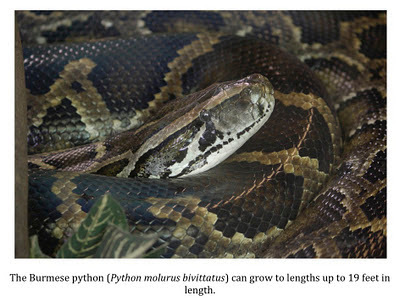 Just how many pythons are there in Florida? It’s a good question and the answer is not readily known. What can be said is that, without a doubt, there are far too many and the number continues to grow. Think about that last line for a moment. 14 pythons in a single day? That is scary. While Florida has become ground zero in the battle against invasive snakes it is by no means alone. 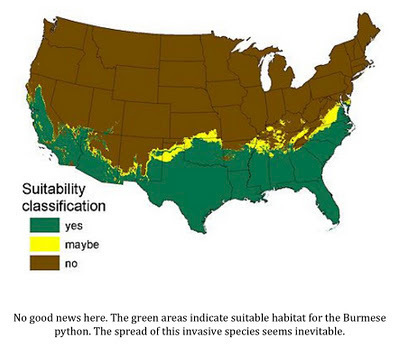 Large constrictors are popping up all over the south and Texas is not immune. They are here and the environment in the bottoms, swamps, bayous, and marshes of the southeast portion of the state are ideal for these massive reptiles. It is likely only a matter of time before we start experiencing problems along the lines of what Florida is seeing. Here is a follow up to the post I made concerning the sighting of a black bear (Ursus americanus) in deep south Texas last week. 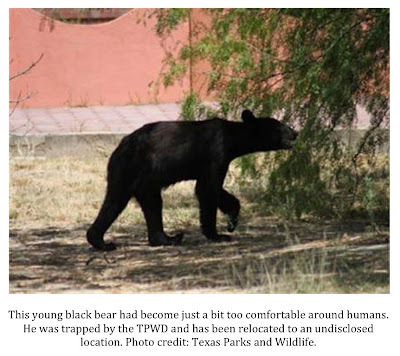 According to an article in The Brownsville Herald, the black bear that has been making the rounds in Starr County has been captured and relocated by Texas Parks & Wildlife officials. The young male bear was captured south of Falcon Dam this past Thursday August 9th. The bear had been raiding trash cans for food and caused quite a stir in this part of south Texas as it has been more than 50 years since a bruin has been seen in the area. Garza made a point to say that black bears are generally not a threat to humans and prefer to stay away from people. This particular bear, however, learned that there was easy access to food in close proximity to people. This created a scenario where a run in between the young 120 lb. male bear and a human was all but inevitable. The article does not say where the bear was relocated but my best guess would be somewhere in the trans-Pecos areas of the state; likely in the Big Bend area. I do have some concerns about the release of the bear. Garza said himself that the bear had learned that people mean easy access to food. While the Big Bend area, if that is where the bear was taken, is lightly populated it is not devoid of people. If this black bear has truly been habituated to people it is only a matter of time before he becomes a problem again. The discovery of what may be a new “flat-faced” human species in Africa has the scientific community buzzing. You can read about the discovery on the LiveScience website here. While final classification of the species is still to be determined, and, no doubt, will be argued over for years, many scientists are leaning strongly toward labeling the species as Homo. 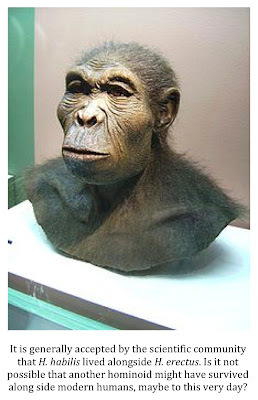 The human lineage of Homo, is thought to have evolved in Africa about 2.5 million years ago. Most scientists feel that the oldest and most direct member of modern human lineage was Homo erectus. 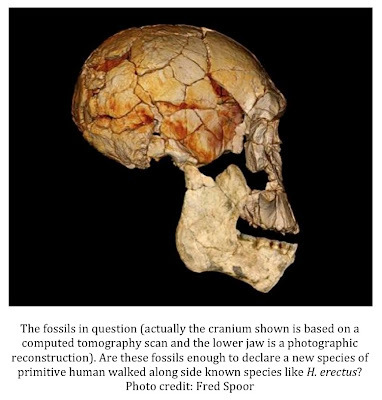 That theory remains unchanged but new finds challenge the notion that Homo erectus was the only member of the human family roaming the African plains all those years ago. In fact, as the fossil record stacks up, it seems that the genus Homo was much more diverse than anyone realized. Researcher Meave Leakey, of the Turkana Basin Institute in Nairobi, Kenya, made the following statement to LiveScience, “Two species of the genus Homo, our own genus, lived alongside our direct ancestor, Homo erectus, nearly 2 million years ago.” Leakey is referring to Homo habilis, a small-brained hominid with a more apelike appearance than that of Homo erectus, and to Homo rudolfensis which possessed a larger brain and flatter face than Homo habilis. Some scientists would throw in a third species. While its inclusion in the genus Homo is still being debated hotly in some circles, the famous “hobbit,” otherwise known as Homo floresiensis, likely shared the planet with these other early hominoids. Some who have a more linear view of human evolution have a problem with the notion that many different members of the genus Homo lived alongside each other at the same time. According to Fred Spoor of the Max Planck Institute for Evolutionary Anthropology in Leipzig, Germany that should not be the case at all. “This shows east Africa about 2 million years ago was quite a crowded place with many diverse species of early Homo,” he said. As stated above, the debate over how to classify these new fossils will likely go on for years. Some scientists have already expressed reservations about whether or not these new fossils are enough to declare that a new human species has been discovered. They point out that the process of classification is often quite subjective and that, rightly or wrongly, there is more funding available for research involving “us” than there is for research involving other species or lineages. That being the case, the tendency to call something a human relative until it is definitively proven otherwise is ever present. However this new species is ultimately classified, one thing has become clear and that is that multiple species of large upright hominoids shared the planet for long periods of time. 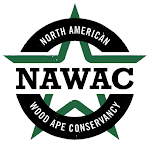 I find it ironic that those in the scientific community who enthusiastically endorse this view are so quick to dismiss the idea that another bipedal primate, like the sasquatch, could exist in the remote corners of the world today. After all, some of these other upright species were alive and well until very recently. Maybe something else has survived and continued to live alongside us. The possibility just doesn’t seem outlandish to me at all. Source: Choi, Charles. "New Flat-Faced Human Species Possibly Discovered." LiveScience. LiveScience, 8 August 2012. Web. 9 Aug 2012. . According to a report from south Texas ABC affiliate KRGV, there is a black bear roaming the area around the small community of Falcon Heights. Texas Parks and Wildlife officials have been called in to track and keep tabs of the wayward bruin. They speculate that the bear crossed into Texas from Mexico in an attempt to escape severe drought conditions south of the border. 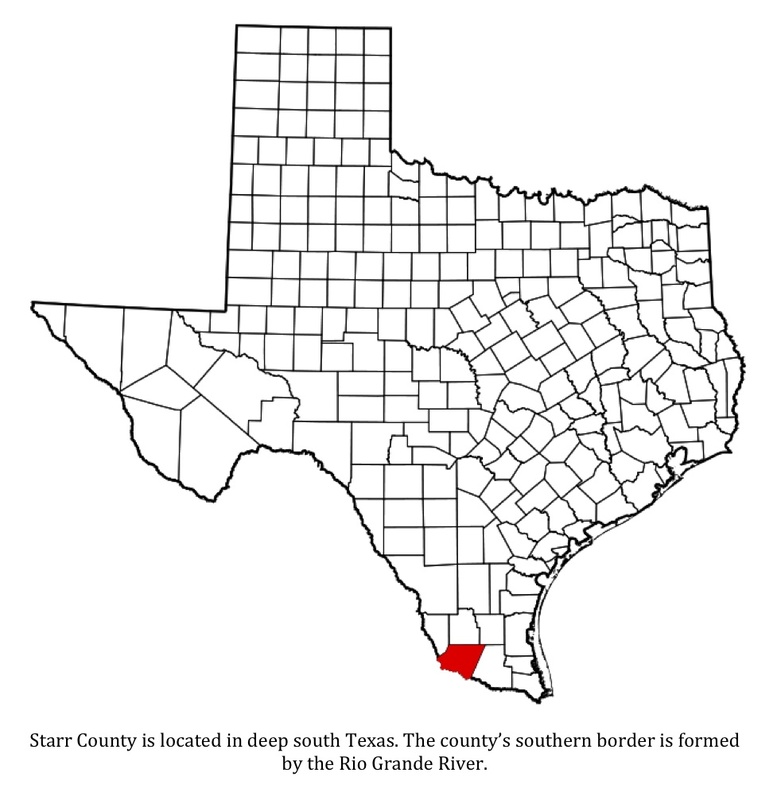 The entire situation is big news in this part of the Lone Star State as it has been 55 years since the last confirmed black bear sighting in Starr County. Captain Fernando Cervantes of the TPWD stressed that locals need to use caution and not harass or hunt the bear. Cervantes stated that the bear may be laying low in an area of dense brush in an unpopulated area about two miles south of Falcon Dam but worries that the bear’s hunger could drive him closer to various small communities. He hopes that TPWD officials can trap the bear before anything unfortunate occurs. “We will trap this bear and relocate him to a safe location where it will be away from the public where he won’t hurt anybody and nobody will hurt him,” said Cervantes. Cervantes does not say where the bear would be relocated if it is caught but my guess would be somewhere in the Trans-Pecos area of the state. 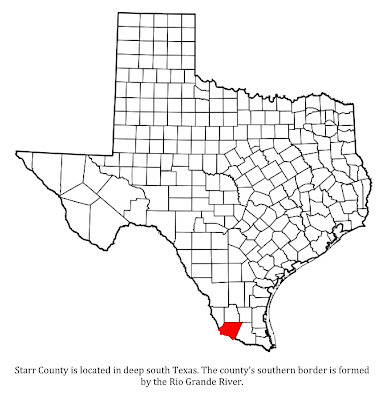 The Big Bend area or the Davis Mountains would be likely relocation areas. 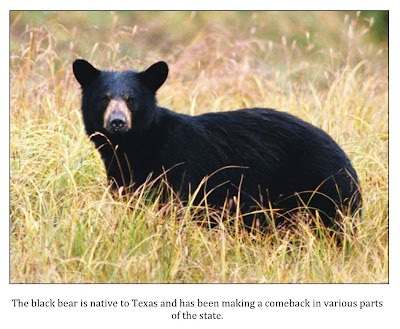 It should be remembered that black bears are native to Texas and once roamed east Texas as well as south and far west portions of the state. Hunting completely extirpated the bruins in east Texas and very nearly did the same in the more remote portions of the state where only periodic sightings were reported for decades. Black bears are making a serious comeback in Texas with healthy populations in Louisiana, Arkansas, and Oklahoma beginning to expand back into the Piney Woods of east Texas. Bear from New Mexico and Mexico continue to cross back into Texas as well with sightings reported as far north and east as the Brady, Texas area within the last year. If you spot a black bear contact the Texas Parks and Wildlife Department immediately.